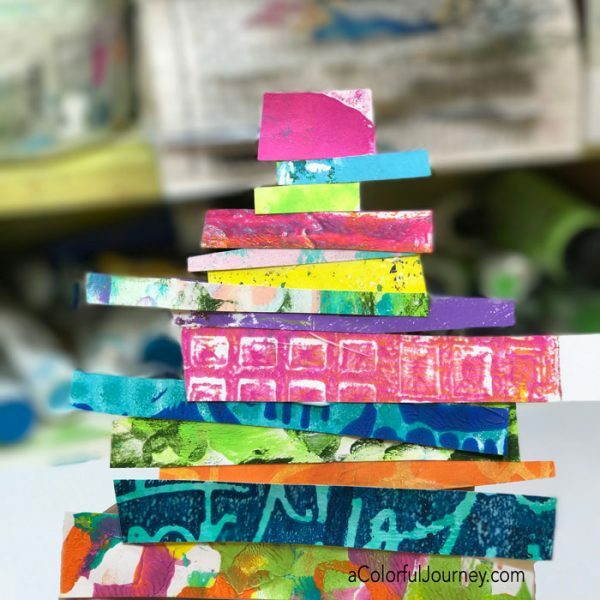 What can you do with a stack of papers made while gel printing? One thing is make a fun and fast holiday card. In the video, you’ll see how it was inspired by a sweater and that there was not a thought of measuring. After all, I’m not a precise type of card maker. 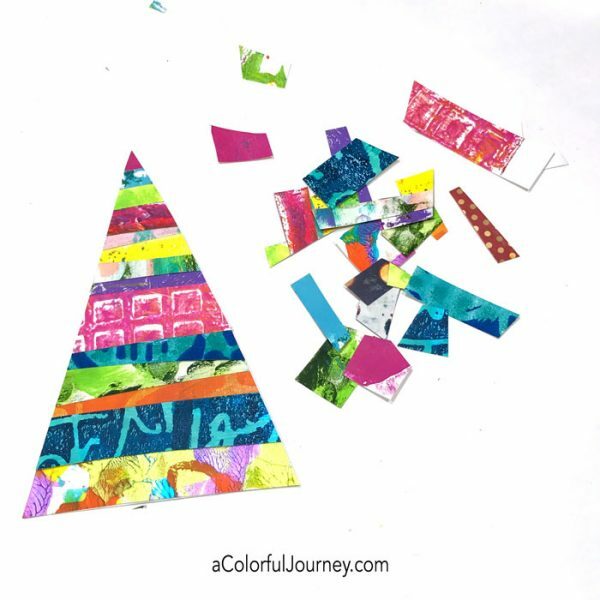 Watch Using gel prints to make a holiday card on YouTube. If you’re brand new to gel printing or just curious how it works, I created a video walking you step-by-step through the process plus there is a downloadable guide. Start with a printed papers. Making a print is fast on gel plate so I had plenty to choose from. 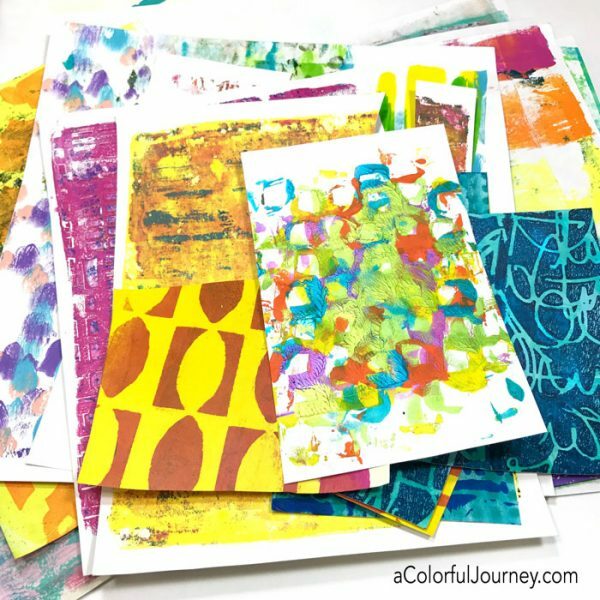 The patterns on these papers were made by using StencilGirl stencils on a Gel Press Plate. With a precision that would make Swiss watchmakers cringe, cut little strips of the paper. They’d cringe because there is zero accuracy with this. Make them any size you want and each one being different is a plus here. Then glue the strips onto a triangle cut from cardstock. I used gel medium, but naturally, any glue will work. Just a quick snip of the scissors and it looks like the papers were made just for this tree. Next the tree needs a trunk, so it isn’t just floating out there. 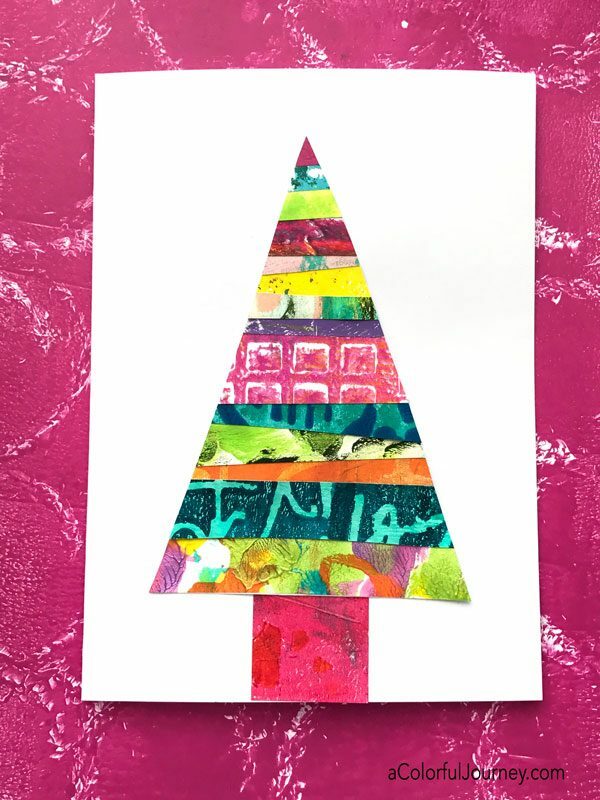 This takes very little paper to create, so large sheets of paper from a gel printing session can make a zillion of these trees. The hardest thing for me about making this card, was finding a way to take a photo of a white card on a white background. O.O.P.S! But every OOPS is an Outstanding Opportunity Presenting Suddenly. I had a spare gel print around to use as a photo background…and that has me thinking that a nice border around the white card could be a good thing…the next card is going to have that border! I love your tutorials and have learned a lot from you (I own 4 DVD’s). However, I think this tute takes the cake. I LOVE these darling cards. Wow your tree turned out soo pretty. I can’t wait to try my own version. Oooh! 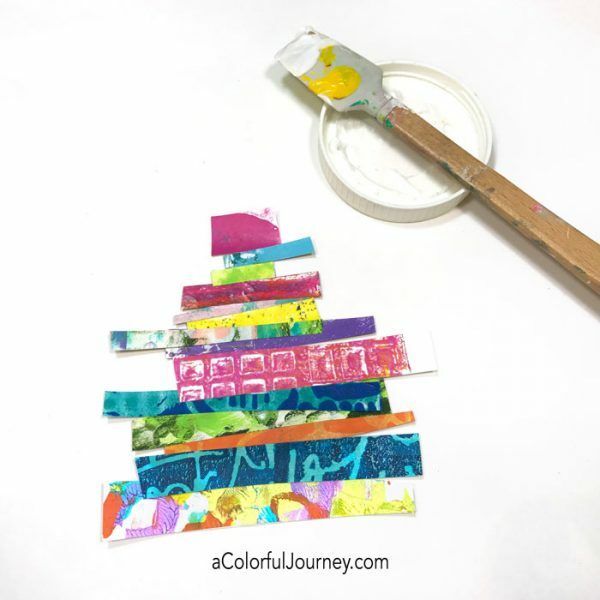 I love this idea too for using paper scraps. So colorful and fun! !